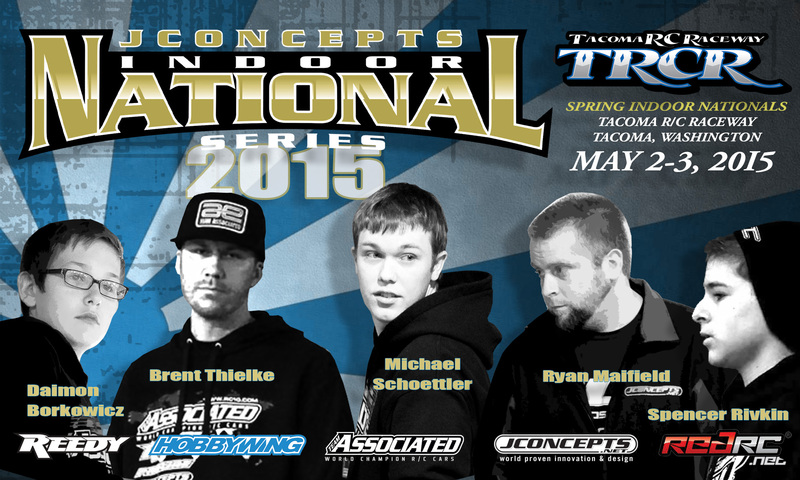 2015 JConcepts Spring Indoor Nationals this weekend @ TRCR! Coming back for another year, the 2015 JConcepts Spring Indoor Nationals makes a return to the Pacific NW for the 2nd year in a row. With this race being the biggest race of the year in the region, many are hoping it becomes a NW tradition, including myself. I believe it’s necessary to have a race in the region that attracts some of the pros to showcase the extraordinary life, talent, and professionalism of the pros and pro teams in order to advance the racing in that region. Some call it…. ‘fire’ as it can ignite a spark in racers to take their racing to a whole new level. Either way, the spectacle will be even hotter this year with Jason Ruona bringing his ace driver, Ryan Maifield to take on the young and talented Michael Schoettler on his home turf. This will be a battle for the ages that leaves me wondering what the Vegas odds are?!?! Oh man! Also making the trip for the 2nd year in a row is AE team manager, Brent Thielke, who is bringing along future star Spencer Rivkin. All the way from Florida and one of my favorite young racers, Daimon Borkowicz is also confirmed to make the show at TRCR. Follow along with the action this weekend as I will be covering live at this event on behalf of RedRC.net/JConcepts and of course 2wdMod.com! If you missed round 1 of the INS earlier this year, have a look back at my earlier posts to catch up starting here. You can also catch last year’s INS race at TRCR here for a bit of history and catch up. Or if you just want to read a story about how a local star JConcepts racer slayed the entire JConcepts travel team in 2wdMod…. click that link! Tags: 1/10th, 2wdmod, Daimon Borkowicz, indoor national series, ins, jc, jconcepts, michael schoettler, offroad, ryan maifield, spencer rivkin, spring, team associated, tlr, trcr. Bookmark the permalink. Previous post ← Why You Like RC’s Bro?